Uttanasana or “intense forward bending pose” is a mainstay in pretty much every style of yoga. It is used as a transition posture, a resting posture, and can even be made pretty active if you know how to engage the right muscles. This pose also has a plethora of variations, all with their own unique health benefits. Here are my top five favorite Uttanasana variations, and why you should give them a try. Stand with your feet hip distance apart, knees slightly bent. Fold your upper body over your legs so that your belly makes contact with your thighs. Bend your knees as much as you need in order to do so. Allow your head and neck to fully relax, and then reach your arms forward so that your fingers touch the floor a foot or so in front of your feet. This reaching forward while you bend your knees in Uttanasana is one of the best ways to really get into your lower back—opening any tightness that may be there. You will also be working to lengthen all the muscles that run along your spine. This is great to practice after sitting for a long period of time. Stand in your usual Uttanasana position—either with feet touching or hip distance apart. Fold your upper body forward, bending your knees if this is more comfortable for you. Allow your head and neck to fully relax. Next, grab your left elbow with your right hand, and your right elbow with your left hand. Allow the weight of your arms to draw your shoulder blades towards your ears. This variation is great for tight and tired upper back muscles. The extra weight of your arms pulling down to the ground, combined with a very relaxed head and neck will create a gentle pull that will help to release the shoulders and the middle and upper back. This is great if you have been stressed and hunching your shoulders up around your ears, or if you have been doing anything that has caused your upper back and shoulders to become fatigued. Be sure to hang out in this pose for at least 10 breaths. Next, draw your arms into ‘T’ position, then draw your palms together along your spine, with your fingers pointing down towards your head. If you are unable to get your hands into prayer position behind your back, you can simply clasp onto opposing elbows behind you. This is one of the best poses I know of for opening the shoulders that does not require a lot of grunt work or effort. While the rest of your body is relaxing in your forward fold, gravity will be working to help reverse any tightness in your shoulders. This pose really targets all the smaller, inner muscles that surround your shoulder joint that are typically hard to access. Begin in your version of Uttanasana—either with knees bent or legs straight. Next, draw your arms back and up towards your tailbone and interlace your fingers. Finally, gently allow your arms to release forward towards your head, keeping your hands clasped. You may point your index fingers forward or keep them tucked in. Like the prayer hands variation, this pose is going to help you open up all the muscles in your shoulders, as well as creating openness and space in your chest. I love this pose because it also works to open up the biceps and forearms—muscles we tend to forget about when we are stretching. 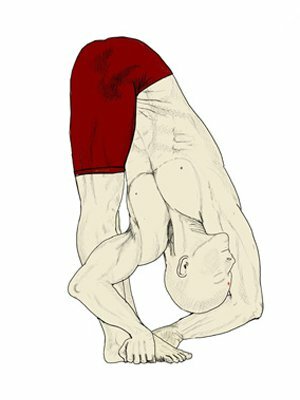 For this pose, you will come into your version of Uttanasana. From here, reach your right arm over to your left outer foot, crossing it in front of your chest. Then take your left arm over and reach your hand to your outer right foot, opening your chest to the left side. You should be looking out from underneath your left arm. Hold for 10 breaths and then reverse your twist. This final Uttanasana variation will help you to stretch the muscles that support your spine in a very concentrated way, depending on which side you are practicing. This pose is also a twist, meaning you will be massaging your digestive organs. I love this pose because you can also play with bending and stretching your knees, helping you get a deeper stretch in your upper back and in your hamstrings. What is your favorite Uttanasana variation? Have you given any of the ones I have listed here a try before?